First up tonight was Daniel Meade and the flying mules. While that may conjure up a mental image of the Wild West, you're only part right - they come from the Wild West of Scotland - Glasgow. A three-piece, he sings and plays acoustic guitar and banjo while accompanied by guitar and double bass. They've got a really catchy sound - a blend of country blues, jazz and ragtime that has a real fun feel to it. It's no surprise that they go down very well with tonight's crowd. I saw Pokey LaFarge for the first time at the Cambridge folk festival last year and was very impressed - he and his band have a distinctive look and a great sound that sets them apart from everyone else, so when I heard he was on tour in the UK I had to go along and see what his headline shows are like. 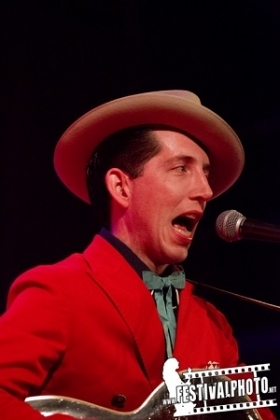 While a lot of bands are going for a retro sound at the moment, it's mainly 1970s rock, whereas Pokey LaFarge and his band have more of a 1930s look and a very different musical style. It's a hard sound to describe - the best I can say is a blend of Jazz and Country Blues.The key thing though is that it's incredibly good music that you can't help but enjoy, and the crowd tonight are certainly having a great time with quite a few people around the edges of the crowd dancing to some of the songs, and at times large parts of the audience are singing along. While pokey sings and plays guitar, his band play guitar, drums, banjo, harmonica, clarinet, saxophone, trumpet, and more - there's definitely plenty going on musically. With a new album (Something in the water) having just been released it's no surprise they choose to play several songs from it tonight, and the new material sounds great. It really is a fantastic performance and was good enough for me to buy a copy of their new album at the end of the night. 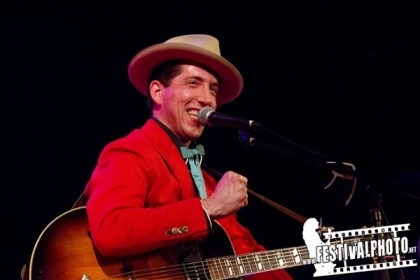 Next time Pokey LaFarge plays the UK I'd definitely recommend you go and see one of the shows.